An interesting article was published in Experimental Eye Research by Marijana Samardzija, Hedwig Wariwoda, Cornelia Imsand, Philipp Huber, Severin R. Heynen, Andrea Gubler and Christian Grimm that examines survival pathways that are induced in the retinas of rd10 mice. Dynamics of retinal degeneration in the rd10 mouse was also examined including an analysis of retinal vasculature and kinetics. The study is fairly comprehensive including crude anatomical approaches, biochemistry, real-time PCR, Western blotting and immunofluorescence. 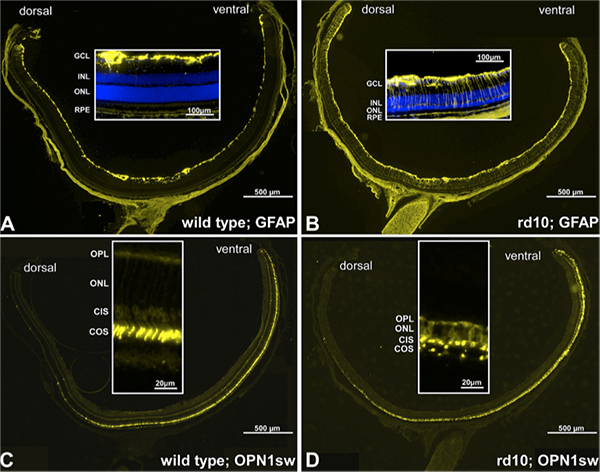 They recapitulate some of the studies that have examined development of the rd10 mouse up to pnd15, but then explored the phases of initial retinal degeneration and explored survival mechanisms and pathways (Lif, Edn2, Fgf2, Mt1, Mt2, p-JAK2, CASP1 and GFAP) in the cells that remain. It would have been interesting to follow these results at later stages of degeneration. The authors mention remodeling, but only in passing which was too bad as there are some really interesting aspects of cell survival there. Regardless, its an interesting paper worthy of having a look at.